Chandeliers are the eye-catching centrepieces that draw people into your space. What your eye doesn't want to be drawn toward is a dusty, dull and lacklustre surface. Cleantech can help. 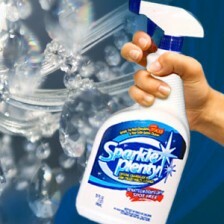 With Sparkle Plenty, the only crystal and fixture cleaner safe for residential and commercial use, we offer the easiest-to-use cleaner on the market. With a quick spray on your surface, the product collects dirt and build-up and drips cleanly off your glass and crystal features, with a protective coating to protect the surface. It smells good, too!